Sudden cardiac arrest (SCA) is a leading cause of death in the U.S., affecting about 326,200 people of all ages outside hospitals every day. Dave Goldberg, CEO of Survey Monkey and husband of Sheryl Sandberg, Facebook COO, was one of its recent victims. During this week alone, about 6,250 unsuspecting victims will suffer SCA, most of them (70 percent) at home. Their hearts will unexpectedly stop beating and blood will no longer flow to the brain and throughout the body. They will collapse, stop breathing normally, and may appear to be having seizures. In essence, they will be dead -- and they will stay this way unless bystanders act immediately to restore their heartbeats with CPR and defibrillation. 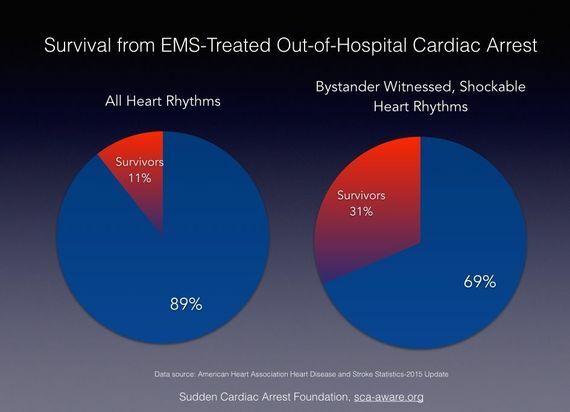 Unfortunately, only one-third of SCA victims receives CPR from bystanders and fewer than five percent are treated with automated external defibrillators (AEDs) before EMS arrives at the scene. But for every minute that passes without CPR and defibrillation, the chances of survival decrease by 7-10 percent. As a result, only 11 percent of victims typically survive. Yet survival rates could double or triple if more people knew what to do when SCA strikes. In fact, as many as 50,000 additional lives could be saved each year. Why don't more people know and use these fundamental lifesaving skills? Seven common myths may be barriers to bystander action. Myth No. 1: SCA is rare. Fact: The number of people who die from SCA each day is equivalent to the number who would die if two jet planes crashed every single day killing nearly everyone on board. Myth: No. 2: SCA is the same as a heart attack. Fact: When people have heart attacks, they are awake and their hearts are beating. When people have SCA, they are not awake and their hearts are not beating. Heart attack can lead to SCA, but there are also many other causes. Myth No. 3: SCA only happens to the elderly. Fact: SCA happens to people of all ages, including more than 6,000 youth under the age of 18 each year. Myth No. 4: SCA only happens to people with a history of heart problems. Fact: SCA is often the first indication of a heart problem. Myth No. 5: Victims are better off waiting for professional help to arrive. Fact: Time is of the essence. Immediate bystander intervention can mean the difference between life and death. Myth No. 6: Only trained personnel are allowed to use AEDs. Fact: AEDs can be used effectively by anyone who can follow visual and voice prompts. Myth No. 7: AEDs can hurt people by shocking them inappropriately. Fact: People in cardiac arrest are clinically dead. Your actions can only help. AEDs are safe and effective and will not shock the heart unless shocks are needed to restore a healthy heartbeat. Given the facts and the tremendous opportunity to save so many more lives, we urge the public to seek CPR and AED training during the first week of June, National CPR-AED Awareness Week. Our growing survivor network is a testament to the fact that immediate CPR and defibrillation saves lives. Since most cardiac arrests occur in the home, taking a few minutes to learn CPR and how to use an AED could mean the difference between life and death for your loved one. Call 9-1-1 and follow dispatcher instructions. Start CPR. Press hard and fast on the center of the chest at a rate of 100 beats per minute (e.g., to the tune of "Stayin' Alive by the Bee Gees). Use the nearest AED as quickly as possible. To learn more about the importance of CPR, watch this PSA, featuring Sudden Cardiac Arrest Foundation National Spokesperson, Susan Koeppen.